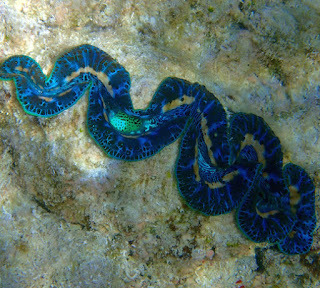 Australia's Great Barrier Reef marked my first fantastic experience with giant and surprisingly colorful clams. The biggest can reach over 440 pounds! Minerva Reef practically blossomed with them, a bit smaller than their Barrier Reef brethren, but in much more prolific with much greater variety. 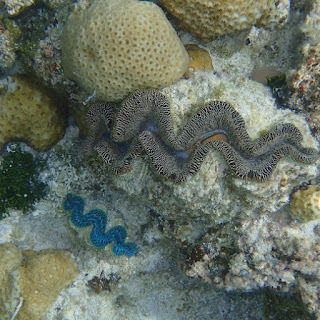 My first giant clam encounter memories are particularly fulsome. 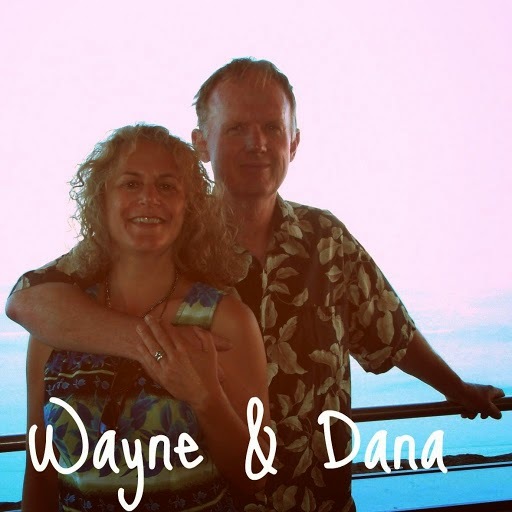 Imagine if you can, enveloping your arm inside a velvety beating heart. A little over a decade ago, that's what it felt like when an Australian dive guide encouraged the lot of us, one by one, to do, following his lead. 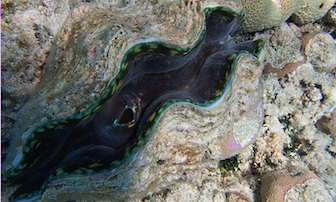 In actuality, what we were doing was gently placing our arm inside the open scalloped shell of a giant clam. My arm inside, the clam opened and closed, opened and closed, touching but not pinching with its velvety body. Incredible. internal and external siphon tubes) are what caught my attention. The Minerva Reef clams sported even more stunning jewel-toned hues and in Minerva's crystal-clear waters, they were as vibrant and easily seen as wandering through a gemstone shop. Alas, Minerva Reef clams were less "open" than those the Australian dive instructor introduced us to, though I suspect Minerva's clammy clams are more the norm. Besides I generally adopt a look-but-don't-touch policy when it comes to interaction with the wildlife. Given we spent nine days at Minerva, if I'd been interested in harvesting, I could've made more than enough clam chowder for all seven boat crews in the anchorage. I guess I'm just not much of a hunter, especially when the prey is so uniquely exquisite. Conventional gray, beige or white clams may not look that appetizing, but I feel less guilt eating them and depending on how they're made, they're quite yummy. Are these Minerva Reef giants "happy as a clam?" Who knows? But they've certainly selected one heckuva a neighborhood, with an excellent supply of fresh plankton to keep them well-fed. 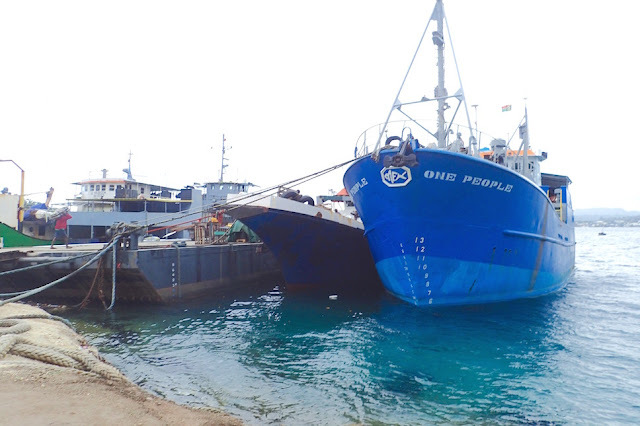 If this post interests you, watch for more posts upcoming on Minerva Reef's wild and wet wildlife. 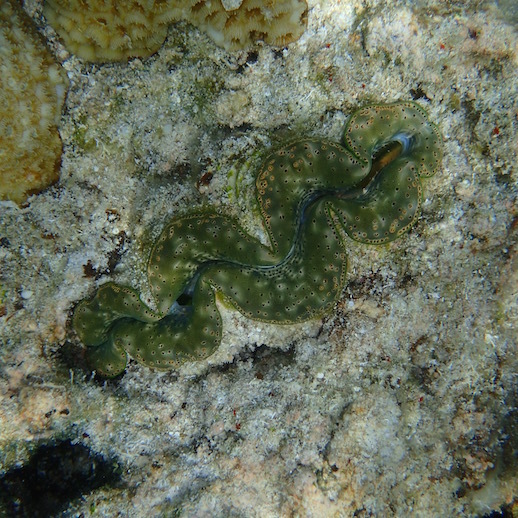 Only saw one clam in Minerva Reef in the lovely olive-green color. This is a recent retrospective of our time in Minerva Reef (S23.39.2253 W178.53.770), November 4-13, 2015. We are currently anchored in Matauwhi Bay (S35.16.353 E174.07.493) near Russell Yacht Club in New Zealand.